Dealing with acne at any age is distressing, but when sensitive, redness-prone skin is also a concern, treating the acne becomes even more challenging. How do you control acne without making sensitive skin worse? What are the best sensitive-skin products if you have acne? We have the answers: The best acne products for sensitive skin can quickly diminish acne while also soothing temperamental skin. It is possible! The first step in learning how to treat sensitive acne-prone skin is cleanser—but not just any cleanser! Forget soaps and bar cleansers (all have issues like causing dryness or leaving a pore-clogging residue) and instead use a gentle, water-soluble cleanser formulated to address acne-prone skin without aggravating it. It’s critical that your cleanser and every other skincare product you apply is fragrance free, because fragrance is a leading cause of sensitive skin. Avoid abrasive scrub-type cleansers, stiff-bristled cleansing brushes, and cleansers that contain essential oils, which are little more than fragrant oils that can make signs of sensitive skin worse. What Are the Best Moisturizers for Acne-Prone Sensitive Skin? When shopping for skincare products for acne-prone and sensitive skin, the key is texture: Avoid creams and oily lotions, and use a hydrator with a lightweight gel, liquid, or thin lotion texture. If such products don’t provide enough moisture, layer them over a soothing, replenishing, alcohol-free toner. 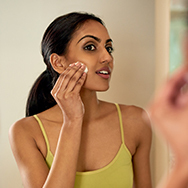 Above all, just as a gentle cleanser for sensitive acne-prone skin should be fragrance free, so should your moisturizer. Shopping tip: Look for moisturizers that contain soothing plant extracts such as licorice root, sea whip extract, willow herb, willow bark, and beta-glucan. All help to minimize signs of sensitive skin without making acne worse. The same is true for beneficial ingredients like niacinamide, ceramides, and hyaluronic acid. Without question, the best acne products for sensitive skin include gentle, fragrance-free formulas (sensing a pattern here?) that contain the two proven over-the-counter acne-fighting ingredients, benzoyl peroxide and salicylic acid. Together, and when used consistently, they deliver a one-two punch that leads to clearer skin. If you’re worried that benzoyl peroxide and salicylic acid aren’t good for sensitive skin, let us reassure you: In carefully formulated products that contain soothing ingredients, both can work beautifully on sensitive skin. That’s the approach we took with our CLEAR Daily Skin-Clearing Treatments and CLEAR Anti-Redness Exfoliating Solutions. Both are available in two strengths, depending on the extent and stubbornness of your acne—and neither contains troublemaking ingredients like menthol, camphor, peppermint, or denatured alcohol. Following the tips above will be proof positive that you can find sensitive-skin products for acne that really work while helping to visibly improve signs of sensitive skin.